Living in London, I have extensively searched beyond belief for “that” burger. Trying restaurant after restaurant that have claimed to cook up a real burger, I have been disappointed at the flat and obviously processed burgers that I have been served. Perhaps I have been comparing too many of them to the tastier burgers I have tried at many restaurants overseas, but surely our glorious London must have ONE good burger to serve up. Thankfully, the fact that I am writing this post shows I may have just found the filthiest, juiciest, tastiest halal burger in the whole of UK (or at least in London anyway). My fellow siblings and I practically ran down Uxbridge high street when we heard of this burger joint serving up delicious gourmet burgers and after two days of online drooling over their extensive menu, we were still unsure what burger to order. Chicken, Veg and Lamb were mentally crossed off in all three of our minds. We were here for the star of the show. The 8oz 40-days-matured beef beauty. Understandably, we were nervous; what if we had overhyped it? What if it doesn’t taste as great as its been made out to be? Regardless, we placed our orders with my brother obviously footing the bill; it was simply guilt- and expense-free paradise for me! 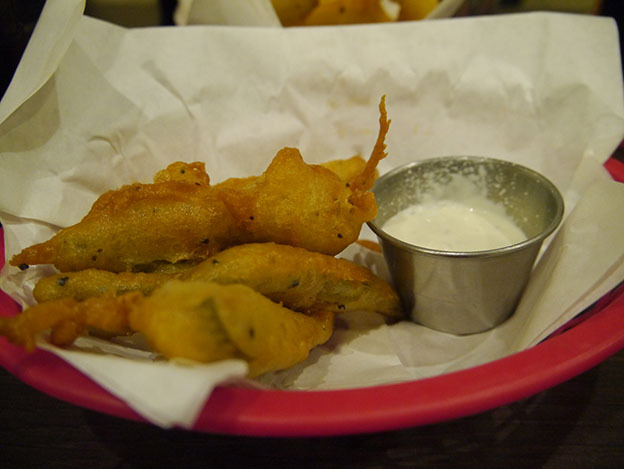 Vinegary gherkin fingers fried to a crispy gold with a complimenting dipping sauce; was it perhaps simply sour cream? Nonetheless it was a perfect pairing of tangy crispiness and creamy refreshment that ended up in us fighting for the last finger; who can beat me? My siblings opted for the Red Iron Burger whilst I chose the cheeseburger to play it safe. We didn’t consider using the forks and knives provided to us – this just was not the time for it. 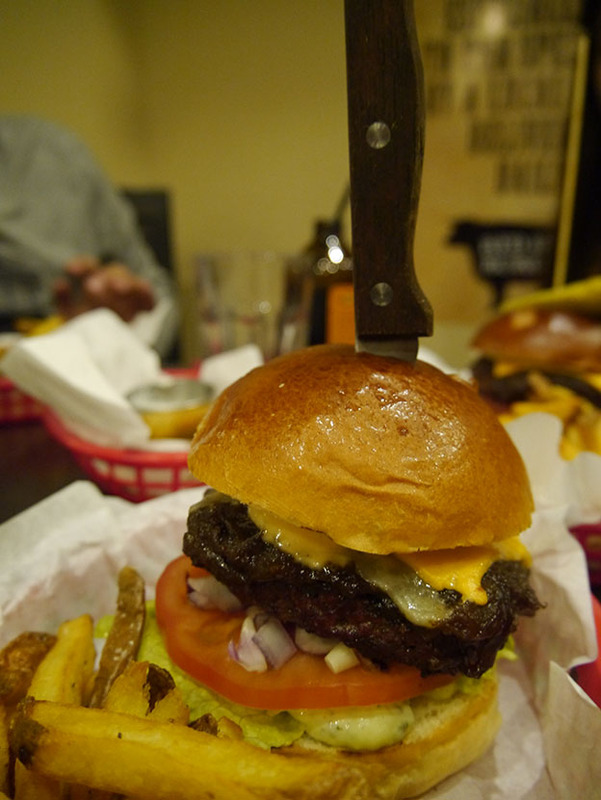 The Red Iron Burger came piled high with a steak knife pierced right through its centre to hold it all together. Onion jam, jalapenos, cheese, their trademark sauce, the absolute works! The siblings didn’t really speak to me much for the rest of the meal… I guess they were experiencing their own food-gasms! Being so adventurous, my ordinary cheeseburger came with a long toothpick topped off with a dill pickle. 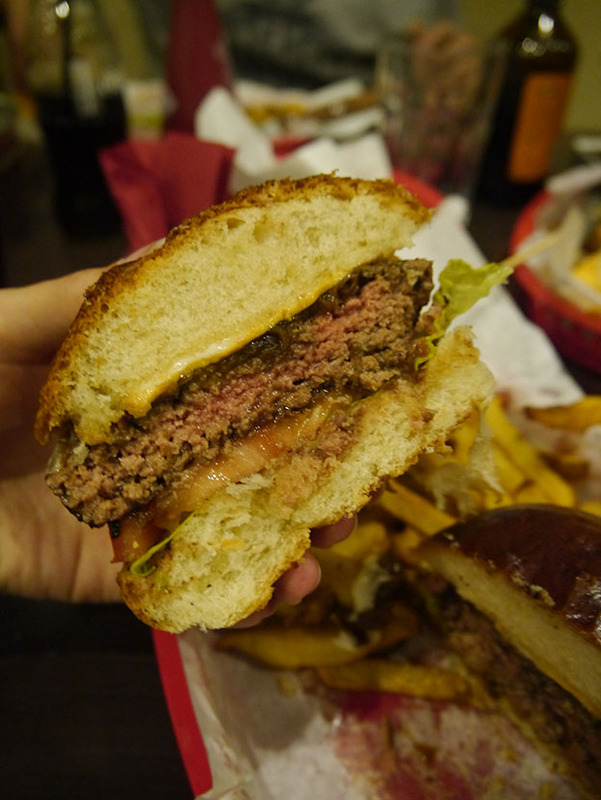 I felt a little disenchanted after having seen their huge juicy burger next to my much smaller-looking cheeseburger, but it was not as ordinary tasting as I had imagined. I had opted for American cheese (but there are lots of other cheese choices available) and asked for the patty to be cooked to a juicy pink medium. It was mouth-wateringly beautiful; just delicious and simply satisfying. All three of us agreed that the next 500 times we visit this place we will omit the sweet red onion jam, but this is a personal family preference of ours. Regardless, this was the best burger we’ve had in a long time. The meat was fresh (never frozen) and custom made on the spot, which resulted in a slightly long (but not too long) wait. Their glossy brioche bun really tried hard to keep the burger and condiments together; the food that makes a mess tastes the best; it is what you get, so roll up those sleeves and prepare to get dirty. The restaurant is situated right in the middle of Uxbridge high street and may need to invest in some heaters, but despite this there was enough seating and the service was good. Price-wise, it was expensive but receiving a gourmet burger cooked from scratch with fresh chips, I didn’t think twice; besides, I wasn’t paying! Halal status verified by owner. P.s. For those who like a good food challenge, Red Iron Burger has THREE challenges for those mighty brave people – super spicy chicken wings, a 32oz burger (so that’s 4 burger patties altogether) and a mammoth sized steak. So head on down there if you fancy being hailed the next Adam Richman (Man vs Food) of Uxbridge. who is the halal certificate from? Yeah can we have more verification of halalness please? Thanks for this great review and great blog. They serve bacon. How is this place halal certified? Have you experienced anything in zone 1? Are none of the wave of new burger joints halal? 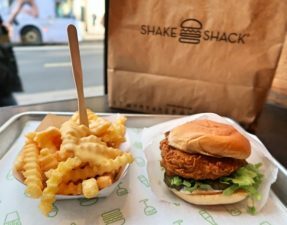 Shake Shack, Five Guys, Honest Burgers, Patty and Bun? Shame! Looking forward to reading about what else you can find! I have and blogged about it ! You have to try BBQ EXPRESS in Watford! The best gourmet burgers and sooo reasonably priced! Are you sure everything is Halal? When I went in they said that the bacon was actually bacon. I had this comment too. I went back in with a friend who was determined it was halal. Their answer was that the bacon is bacon. Upon further questioning, the server confirmed it was halal and not made from pig but rather turkey. 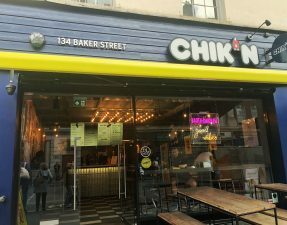 I can confirm that Pho vietnamese use halal chicken and stock as well as Benito’s Hat mexican food who use halal chicken in both braised and grilled guises! But still no gourmet halal burgers in central London. I think I may have to rectify this situation myself! mmm I aboslutely LOVE pho! 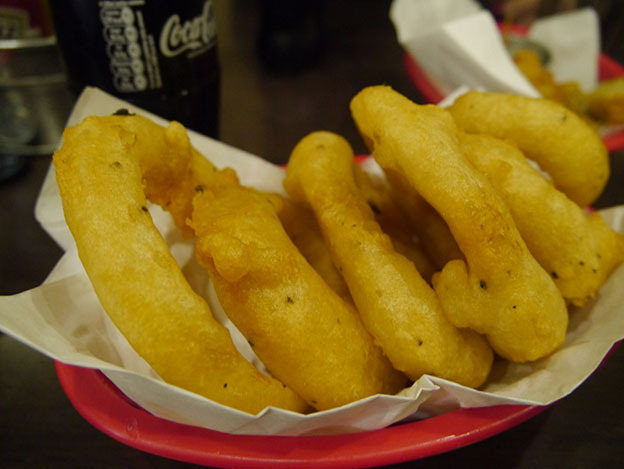 But I actually prefer their vegetarian option to their chicken options but I can always add it to the blog! I’ve never heard of Benito’s Hat – will have to check it out. 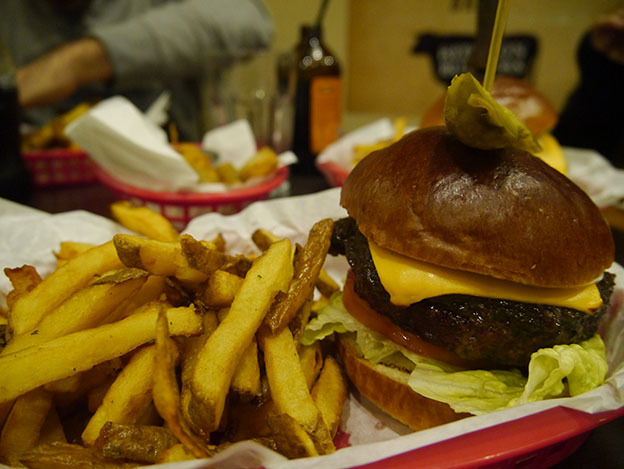 And unfortunately, halal gourmet burgers in London is still not happening – but 2014 is a new year so who knows! 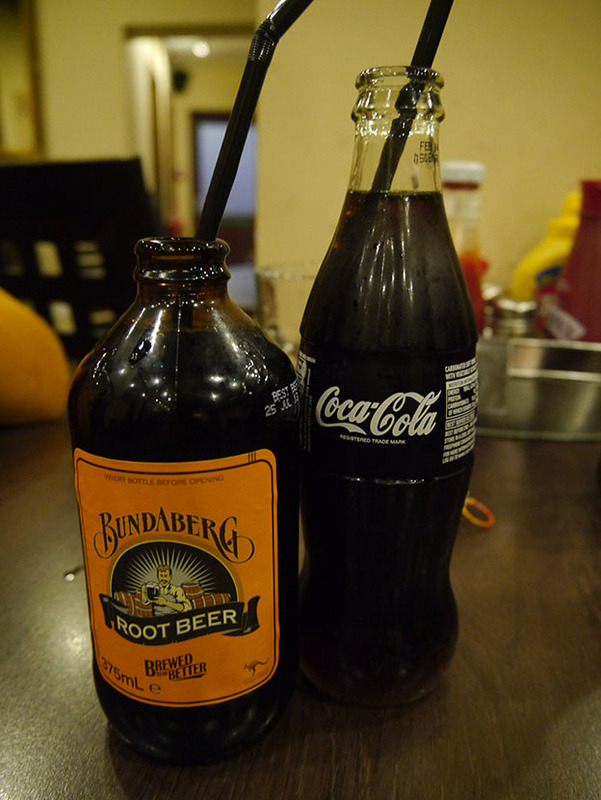 Bundaberg root beer has alcohol in it. Trace amounts but enough to write it on the bottle. Hi is this place serving non-stunned halal meat? You should try big moe’s in east london. Its set up as an american diner and hmc certified. Check their fb page. Some really good stuff. I have no idea when you tried Big Moe’s but that place has gone down hill a long time ago… I went there three times, first time I ordered the T-bone steak which was cold and didn’t taste of anything. Second time was the burger which had a dry bun and the burger patty itself wasn’t seasoned. The third time we just ordered the Malt Milkshakes and Ice-cream which was actually very very good. Their Deserts are good but that’s about it. Just went there and loved it! Thank you for the blog and letting us know about such an incredible place. Hey lovely. There’s a new goumet burger place in Osterley ‘man vs food’. It’s halal and meant to be very good, I haven’t been yet just wanted to know if you would blog about it?? Hey, I had no clue it existed – thanks for the heads up! Going there today to break my fast! Rubbish burger, tried the red iron burger and their special “cupid burger”. I flouted my rule about specials – they’re just rubbish where they make most of their profit on and avoid . Well I realised later what a mistake I made, cupid burger had a buffalo patty. It was so sour and nothing to balance it with. Red iron burger was average at best, I don’t know why the place gets rated so high on google and facebook with so many 5/5 ratings. The cake the burgers with cheese and dressing/sauces. Obviously to mask the rubbish meat. That’s a pretty low rating considering it’s one of your fav burger joints! I personally give this place an 8 – the atmosphere kind of brings it down, but overall, the food is delicious! And their milkshakes!